Disease symptoms include a browning or purpling of needles, which eventually drop from the tree leaving bare patches. This symptom gives the disease its name “needle cast”. Typically symptoms first appear on the lower branches of a tree and work from the inside of the tree out. Optimal conditions for Rhizosphaera spp. are during times of excess moisture and humidity. This disease is common in the spring but we receive samples anytime throughout the growing season. Once a tree is diagnosed with Rhizosphaera needle cast, the management tactics aim to reduce the spread of the disease to healthy tissue. One common misunderstanding about this disease is that once needles become infected they cannot be “cured”. Once needles are infected they cannot be healed or cured and will eventually fall off of the tree. While there are fungicides that help to manage this disease, the main use is in protecting new needles from the fungal pathogen. With patience, new needles can eventually help to fill in the bare patches caused by the disease initially. While fungicides are an option, there are several other ways to stay on top of this disease and keep your trees healthy. Prevention is the first line of defense against rhizosphaera needle cast. In order for disease to occur three things need to happen; the pathogen needs to be present, the environment needs to be conducive for disease development and there needs to be a host that is susceptible to disease. One option for management of this disease is to simply not plant susceptible trees. When considering spruce trees; blue spruce is the most common and most susceptible host of Rhizosphaera spp, followed by black hills spruce. Norway spruce would be a less susceptible tree. Other conifers including pine, fir and cedar are rarely infected with rhizosphaera. In situation where spruce is the tree of choice, try to avoid blue spruce and take a look at Norway spruce as an alternative. In situations where planting susceptible spruce trees is unavoidable, going out of the way to maintain plant health can be a step in the right direction. 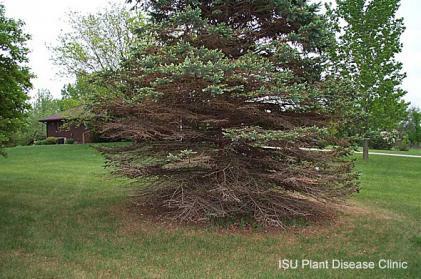 Remember, spruce trees are not native to Iowa and at times the climate can lead to stress on an otherwise healthy tree. This stress is often the tipping point that allows pathogens to infect. Some things to consider in keeping a spruce happy are; planting depth, watering practices, nutrients, soil type, location, spacing etc. Keep a close eye on existing trees. The sooner symptoms are noticed, the sooner action can be taken to prevent a disease from getting out of control. If the symptoms described above and in the pictures below are noticed, examine the affected area carefully.Rhizosphaera spp picnidia (the fungal fruiting structures) are sometimes visible using a hand lens for magnification. 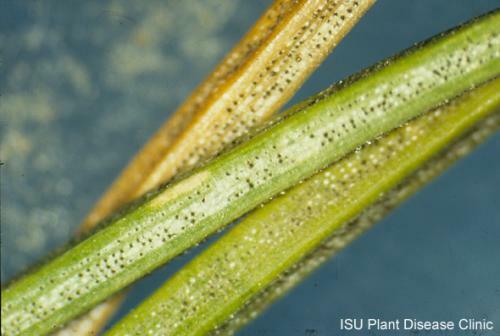 Picnidia can be seen as small black specks that will appear in the stomata of each individual needle. Depending on environmental conditions (dry or hot weather) and infection timing, you may not always be able to find these structures or the needles bearing these structures may have been shed. Keep in mind, there is a look a-like disease called stigmina needle cast. Symptoms of stigmina needle cast are almost identical to those of rhizosphaera needle cast. High powered magnification is required to differentiate between the two. Management may be similar for these Rhizosphaera spp and Stigmina spp; however effects of fungicides on Stigmina spp have not been thoroughly studied. This is why accurate diagnosis is critical. 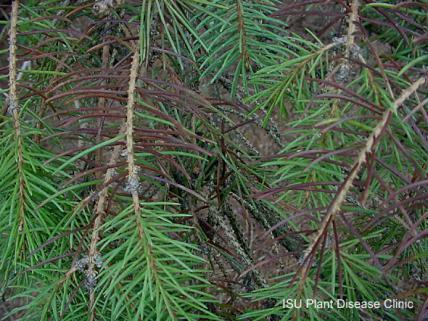 Anyone considering treatment of their conifers or other trees can visit the Plant and Insect Diagnostic Clinic website at clinic.ipm.iastate.edu, to learn more about how to submit a sample to confirm the cause of a problem. Also see our previous HHPN article about collecting samples for suspected rhizosphaera needle cast. With many fungal pathogens like Rhizosphaera spp, removing infected tissue can help to slow the spread of disease. Since spores of the fungus are spread by wind and rain splash, removing the infected tissue can reduce this spread. If you spot the disease early enough you may be able to prune away infected branches and reduce the spread of the fungus. It is also helpful to prune while the plant is dormant and during dry conditions. Pruning can also help increase airflow to reduce the amount of humidity held inside the trees canopy. Since Rhizosphaera spp prefers moist environments, it is important to prune. This can also be helpful in large stands of trees that have grown into one another. When all other management is not enough, fungicides can be used to help manage rhizosphaera needle cast. Precise timing is necessary for this method to help, since protection of new growth is the motivation for spraying. Due to the variability of typical spring weather from year to year, it is better to time sprays by observing the new growth. When needle length of the new growth is roughly half the size of old growth, the first spray should be applied. A second spray should then be applied 3-4 weeks later. Sprays may need to be made for 2-3 consecutive years depending on severity. Products containing chlorothalonil or other active ingredients listed for rhizosphaera needle cast can be used for treatment. Remember to always follow the instructions on product labeling.